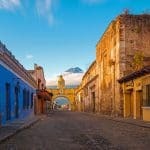 Cherish an opportunity to explore the many innovative facets of two less-visited Central America countries. Begin your morning with a private scenic transfer to Copan, Honduras. 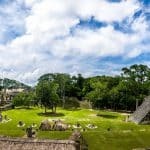 Upon arrival, tour the famous Mayan site of Copán, known as the Paris of the ancient Mayan cities. Copán boasts amazing sites, which include an intricately carved stelae and an amazing hieroglyphic stairway. After visits to the various sites and local museum, you will return to Hacienda San Lucas for lunch. 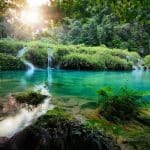 Later, walk in the lush, shady river valley of the Copán Bird Park, where a local guide will accompany you to interact with a number of beautiful tropical birds; rescued from all over Honduras. Once ready, you will be transferred back to your hotel. Your private guide, Carlos, will meet you at hotel reception this morning to begin your full-day excursion to a lovely finca. Carlos’ family owns the farm and will accompany you on a tranquil horseback ride through the farmlands and beautiful scenery of the Copán Valley. Following the ride, enjoy a hearty farmhouse lunch cooked by Carlos’ mother. You will also have the opportunity to taste the coffee that is grown on the property. In the afternoon, explore the coffee and cardamom plantations and learn a bit about cattle ranching. En route back to Copán, your day concludes with a dip in the hot springs. Enjoy the scenic transfer to Río Dulce, Guatemala, with your driver, stopping for an unguided visit to the UNESCO protected site of Quirigua. Once you reach Río Dulce, enjoy an evening to explore the area or relax at your exclusive hotel. Your guide and boat captain for the day will meet you at your hotel this morning. Your day includes a private cruise along the Río Dulce River, through the central canyon and down to riverside towns. Along the way, you will see a great variety of birds and possibly get a glimpse of the elusive manatee. You will pass more riverside villages before arriving at the hot springs, where you will have time to enjoy a swim. Your final destination is the Garifuna town of Livingston, located on Guatemala’s Caribbean Coast, where you will have time to explore before again boarding the boat to return to Río Dulce. Back at the hotel, you will be transferred to the airport by your driver in time for your return flight home or on to your next Willing Foot location.